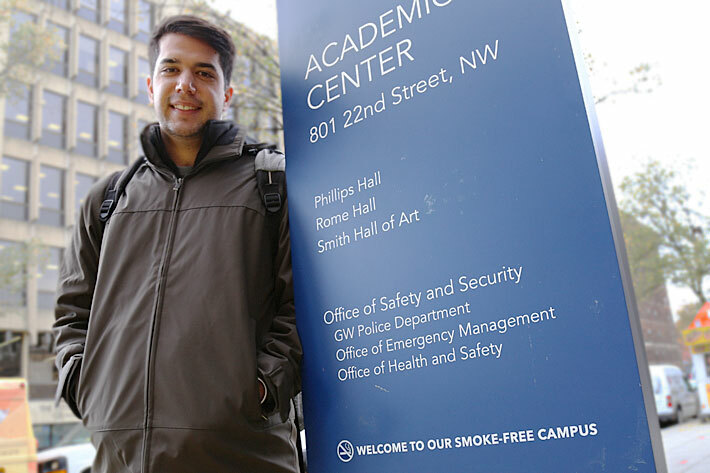 A year after implementing a smoke-free policy, GW's Foggy Bottom Campus is a friendlier environment for ex-smokers, said Tim Rabolt, a senior in the School of Business. Tim Rabolt is an ex-smoker. And one of the most difficult things for an ex-smoker to endure is being around people who smoke. A year after GW implemented a policy to go smoke free, Mr. Rabolt finds the Foggy Bottom Campus a friendlier environment for former smokers. The policy, launched in August 2013 and finalized last November, prohibits smoking in university-owned outdoor spaces, as well as public spaces adjacent to all residential, academic, athletic, recreational and administrative support buildings. The one-year anniversary of Smoke-Free GW coincides with Thursday’s Great American Smokeout, a nationwide event that encourages smokers to quit for one day and to make a plan to quit for life. Mr. Rabolt, who began smoking in high school and quit Nov. 20, 2011—during the fall semester of his freshman year—has seen marked improvement at GW since the policy went into effect. New all-white static clings are being posted on glass doors around campus, replacing the old blue-and-red ones. Signs posted around campus have given individuals a reference to create a culture around the policy, said Erica Hayton, director of benefits and wellness in University Human Resources. Campus signage is currently being upgraded, she said. Blue and red static clings on doors are being swapped out for more visible, solid white ones. A “welcome to our smoke-free campus” message is being added to the blue pylons in front of campus buildings. A process also is underway to secure permits to install signs on D.C.-owned space around campus. Mr. Rabolt quit smoking Nov. 20, 2011, during his freshman year at GW. He said signs around campus have helped those who have quit remain tobacco free. GW recently added a "welcome to our smoke-free campus" message to the blue pylons in front of campus buildings. The signs, Mr. Rabolt said, also help those who have quit or are trying to quit. Relapse is common for ex-smokers. A cessation program called “Quit For Life” went into effect in 2012 ahead of Smoke-Free GW. In two years, 52 members of the university community have enrolled in the program. A university-backed, community-driven policy amplifies support for ex-smokers trying to remain tobacco-free, Mr. Rabolt said. “It makes it easier than just doing it alone,” he said. 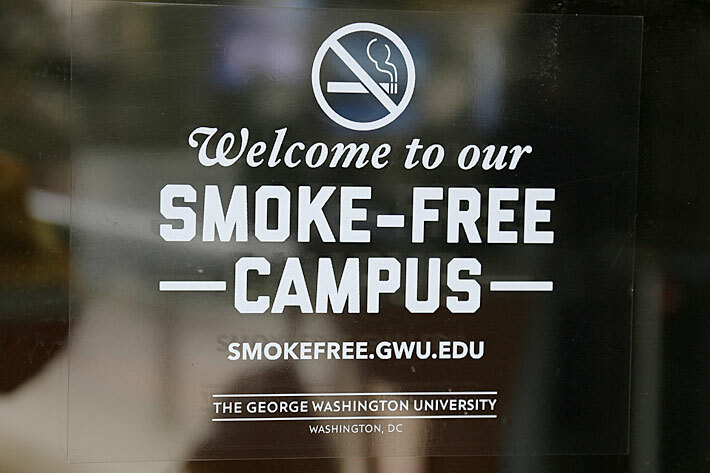 Ms. Hayton said one of the reasons behind the additional signage is that members of the GW community want to accelerate the movement toward a smoke-free culture on campus. After a transition-and-feedback period, Smoke-Free Policy becomes official just before Great American Smokeout. Smoke-free policy put into effect to ban smoking on all GW campuses.